With four weeks left in the regular season, the Georgia High School Association will be expected to announce its state championship venue locations soon. The championship dates are scheduled for May 20-22. The first four rounds of the postseason are played at the higher seeded team. Only the state championships, a best-of-three format, are played at neutral site locations. Since the GHSA went to neutral sites two years ago, Rome's State Mutual Stadium and Savannah's Grayson Stadium hosted the state baseball championships in 2017. However, in 2018, the GHSA added two additional sites -- Georgia's Foley Field and Mercer's Ortho Georgia Park -- joined State Mutual Stadium and Grayson Stadium. Look for the GHSA to announce its venue locations soon. The War Eagles are 13-4 on the season. OKEFENOKEE BATTLE: Clinch County's Warren Stovall earned a complete-game victory as the Panthers topped Charlton County 6-2 on March 19 to take the lead in the Region 2-1A standings with four weeks left in the regular season. Clinch and Telfair County have identical records, but the Panthers hold the tie-breaker after beating Telfair earlier in the season. Clinch will visit Telfair on April 12. Stovall allowed two unearned runs on three hits. He also had a double and scored in the game. Charlton County had seven errors. BIG BATTLE IN CLASS 1A PUBLIC: Class 1A Public No. 2 Schley County outdueled previous No. 3 Johnson County 5-1 in a nonregion game played March 20 at Middle Georgia State College. The two teams could meet again in the postseason with much more higher stakes than bragging rights. Garrett Peavy and Ashton Goodin combined to allow just an unearned run on five hits. Dylan Windham led Schley at the plate, going 2-for-3 with a double and a RBI. Schley County is 14-1 on the season, while Johnson County is 14-2. ETC., ETC. : Jeff Davis swept a trio of games last week from previous No. 10 Vidalia to take the early lead in the Region 2-2A standings. After taking the first two games of the series, Hamp Hayes' walk-off single in the bottom of the eighth scored Ethan Hulett and helped the Yellow Jackets to an 8-7 victory. ... Eastside's Jackson Feeney allowed just one unearned run on one hit and struck out six to help the Eagles top previous No. 6 Woodward Academy in a key Region 4-4A game on March 20. Sambo Button went 2-for-3 with an RBI, while John Robert McGowan had a solo homer to pace Eastside's offense. ... In Class 7A, Walton took two of three from previous No. 6 Woodstock last week. Luke Boynton's three-run homer propelled the Raiders to a 4-2 victory on March 19. Pierce Gallo scored on Jared Jones' sacrifice fly as the Raiders scored two in the bottom of the seventh to top Woodstock 6-5 in the second game of a doubleheader on March 22. Woodstock's Josiah Siegel struck out 12 to help the Wolverines to a 13-5 win in the first game of the doubleheader on March 22. ... A pair of Georgia coaches recorded their 100th wins last week -- Cedar Grove's Lavato Byrd and Heritage-Conyers' Shane Ramsey. Editors Note: Here this week's weekly submissions from schools. Hillgrove defeated McEachern three times in Region 3-7A play last week. Second baseman Jack Gilsenan went 4-for-6 with a homer and seven RBIs. He scored three runs and walked twice. First baseman Reid Brown went 3-for-6 with two doubles, two RBIs, scored four runs and walked three times. Hillgrove is 14-4 on the season. North Forsyth improved to 10-7 on the season with a pair of victories over Forsyth Central and South Forsyth. Left-hander Anthony DiMola, a Georgia Southern commit, hurled a four-hit shutout in a 3-0 victory over Forsyth Central on March 18. He struck out 11. On offense, Carter Mullikin combined to go 6-for-8 with four doubles, while Charlie Aiken combined to go 4-for-7 with four RBIs. Parkview won four games last week, including a trio of shutout Region 7-7A victories over Norcross (twice) and Berkmar, as well as an 11-1 win over Hoover (Ala.). Offensively, Jonathan French combined to go 6-for-11 with two doubles, two homers, 10 RBIs, seven runs and three walks. Allan Del Castillo combined to go 4-for-9 with a double, two RBIs and five runs. Jonathan Ponder combined to go 3-for-7 with a double, two RBIs and three runs scored. On the mound, Miles Garrett threw just 76 pitches to help the Panthers top Norcross on March 18. 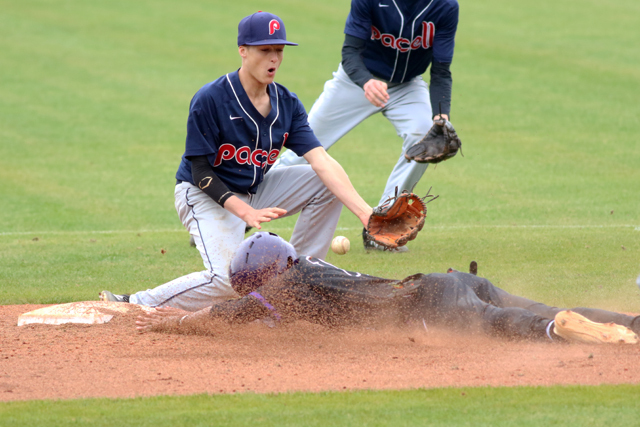 Xander Stephens hurled a complete game on March 20 to help Parkview beat Norcross again. Stephens allowed no runs on five hits, walked two and fanned seven in a 2-0 win. Cameron Orr earned a complete-game win over Hoover, throwing six innings and allowing one unearned run on four hits and striking out five. Woodstock went 1-2 last week against Walton. Offensively, Brennan Milone combined to go 4-for-8 with a homer, four RBIs and three walks. Colby Cox went a combined 6-for-11 with four RBIs. Preston Gunnell went 3-for-5 with a homer, four RBIs and two walks, Spencer Keefe combined to 4-for-9, scored five runs and stole four bases. On the mound, freshman Kameron Douglas pitched 4 2/3 innings in relief, allowed no runs on two hits and struck out five. Senior Josiah Siegel's complete-game helped the Wolverines win 13-5 in the first game of a doubleheader on March 22. Richmond Hill pitcher Nick McCollum tossed a complete-game, one-hit shutout to beat Brunswick 11-0 on March 18. He struck out eight and walked three, throwing just 91 pitches in the game. The Wildcats are 13-4 on the season. Thomas County Central improved to 15-1 on the season and defeated Lowndes and Warner Robins twice. In the 6-5 win over Lowndes, Shane Stephenson's walk-off scored two runs to end the game. Luke Benton pitched five innings, limiting the Vikings to one run on four hits. RJ Delaney and Pace Mercer continue to provide strong performances on the mound, each getting a win against Waner Robins. Delaney pitched six innings, allowing three hits and striking out six. Mercer pitched four innings allowing one earned run on two hits and striking out five. Meanwhile, Nick Herndon combined to go 8-for-11 in the three games. He hit for the cycle in the first game of a doubleheader win over Warner Robins. Delaney was a combined 5-for-11 for the week, driving in four runs. Zach Fletcher hit three doubles. Cartersville opened Region 5-4A play with two victories over LaGrange and a win over Central-Carrollton. Outfielder and South Alabama signee Preston Welchel combined to go 7-for-8 with a pair of doubles, four RBIs and scored five runs. His two-run, walk-off homer helped the Hurricanes top LaGrange 2-1 on March 20. He also walked twice and was hit by a pitch twice. His on-base percentage was .917 in the three games. Cartersville is 14-3 on the season. Westover went 2-1 last week, including a 15-0 victory over Dougherty and a 14-0 win over Shaw. La'Borris Buchanan, Kedarrius Cunningham, Alex Ingram, Cameron Hopkins, Antonio James, and Rodney Bullard combined to bat .510. They combined for three doubles, four triples, 19 RBIs, 24 runs, and 23 stolen bases. Cunningham tossed a no-hitter against Shaw, striking out 11. Antonio James pitched 5 1/3 innings and allowed just one earned run and five strikeouts. In a trio of Region 6-3A victories last week over Murray County, North Murray and Coahulla Creek, Ringgold had several strong offensive performances. Andre Tarver went a combined 6-for-8 with a homer and four RBIs, Holden Tucker combined to go 4-for-9 with four RBIs, Wyatt Tennant went 4-for-10, Daulton Schley combined to go 3-for-8 with five RBIs, Brayden Broome went 4-for-9 with four RBIs, freshman Mason Parker went 5-for-9 with five RBIs and Johnny Camilluci combined to go 3-for-7 with six RBIs. The Tigers also had some solid pitching performances. Tucker struck out nine and allowed one earned run in a victory over North Murray, Tennant struck out eight in 4 1/3 innings to record the victory over Coahulla Creek and Camilluci allowed two earned runs while striking out seven in five innings to defeat Murray County. Ringgold is 14-4 on the season. North Cobb Christian pitcher Zach Turner helped the Eagles to a big 2-1 victory over Mount Paran Christian on March 19 in a key Region 6-1A battle. Turner no-hit Mt. Paran and struck out 11 to earn the complete-game win. In 21 innings this season, Turner has a 0.45 earned run average. He has allowed just five hits and struck out 41. North Cobb Christian is 10-9 on the season. Pinecrest Academy has won eight of its last 10 and the Paladins are a legitimate player in Region 6-1A. Pinecrest went 2-1 last week with a victory over Saint Francis and a split with Fellowship Christian. Pitcher Patrick O'Rourke, a Berry College signee, was the winning pitcher against Saint Francis on March 18 and again on March 22. O'Rourke tossed two complete games and combined to allow only two runs and two walks in the two games. He struck out 10 in the 14 innings. On offense, junior outfielder Mason Carter hit .500 in the three games with three doubles, four RBIs and stole five bases. Junior Caleb Bohn hit .400 during the stretch with two homers and seven RBIs. Pinecrest is 8-7 on the season. In a pair of wins over Kings Ridge Christian, Saint Francis combined for 29 hits and scored 20 runs. Senior Will Clark had six hits and a pair of RBIs. Junior Bennett Drake had five hits (4 singles, 1 triple) and four RBIs while scoring four times. Seniors Kyle Bork and Bret Madren both had four hits apiece (2 doubles each and 6 total RBIs). On the mound, Jack Gerber earned his third win on the mound and senior Will Clark earned his fourth. Saint Francis is 12-4 on the season.